The Chinese art of paper cutting has been around for centuries, and was first used for religious ceremonies and rituals. 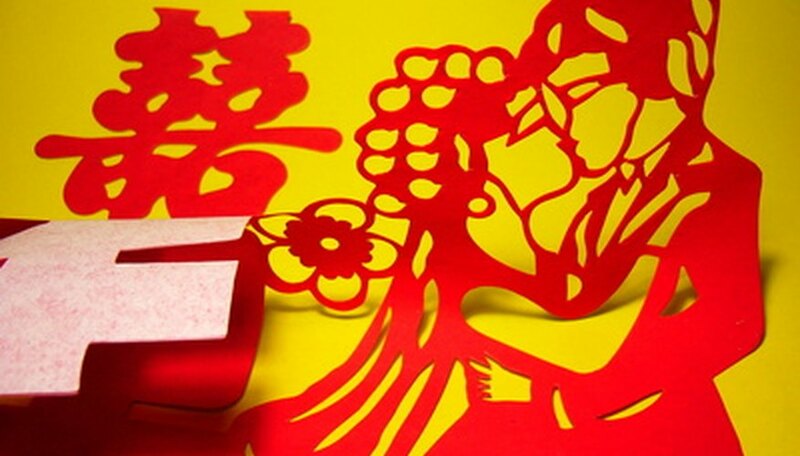 Today, paper cuttings are mainly used for decoration, and they have special meaning at Chinese festivals and holidays. There are two kinds of paper cutting: knife cutting and scissor cutting. Expert paper cutters depict very intricate images in their work, but inexperienced artists can also enjoy the craft using relatively simple patterns. Archaeologists have found evidence of Chinese paper cutting existing as far back as the 6th century. Women used cuttings of gold and silver foil to paste in their hair when they went to temples, and men used them during sacred rituals. Certain kinds of paper cuttings were buried with the dead or burned at funerals, and they were used as offerings to the ancestors and gods. As times changed, paper cuttings were used as special decorations during festivals. Today, paper cuttings are popular as decorations and as an arts-and-crafts hobby. However, special designs are still significant at festivals and on holidays. For example, during the Lunar New Year, auspicious patterns are cut out and pasted in homes to bring good luck. During a wedding ceremony, a large red paper cutting of the Chinese character "Xi" -- which means joy -- is displayed. When an elder is celebrating a birthday, the character "Shou" will be placed somewhere to represent longevity. During almost any traditional joyous event, red paper cuttings are used to decorate tables and walls to symbolize the happiness of the occasion. Artists usually sketch their designs with pencil or paint brushes onto paper before beginning their paper cutting. However, some artists now prefer to use computers for drawing their designs, since the original design will not be lost or ruined as easily as a physical drawing. Inexperienced artists may prefer using simpler patterns to begin with, such as large characters or outlines of animals. When a design is finished, a copy of it is made to use as a base pattern before the artist begins the paper cutting. In knife cutting, several layers of Xuan paper are placed under the base design, and a craft knife or razor is used to cut through the lines of the pattern. Xuan paper is a thin paper ideal for paper cutting. Artists can cut up to 40 layers of paper at a time for basic designs, but as few as 4 to 8 layers of paper are carved simultaneously for more complex patterns. One way to check the quality of the work is to examine how rounded the cuts are on any curves, and how even the cuts are on straight lines. Experienced craftsmen can carve out perfect circles with knives, but inexperienced artists may produce some rough edges on their rounded areas and lines. Scissor cutting is more difficult than knife cutting, as the artist cannot maneuver scissors around very detailed designs. Artists are also unable to cut as many layers of paper at the same time with scissors. However, it is possible to create scissor-cut paper art without drawing a pattern first. Experienced artists can use scissors to cut symmetrical patterns from memory. In scissor cutting, cuts are made into folded Xuan paper to create the patterns. It is possible to create non-symmetrical designs with scissor cutting, but usually only very experienced craftsmen do this well.